Photo by: Dorothea BylicaSurely you’ve heard the rumors by now. You may as well go see for yourself why this unassuming little trattoria is getting so much attention. On any given Saturday evening, one is liable to happen upon a crowd of ranking diplomats, corporate executives, and just about everyone else who can get in the door devouring pasta in a non-descript venue in Prague 6. What is going on in there? What indeed. The key to Italian cuisine, it’s often said, is exquisite simplicity. Doing more with an ordinary tomato or mound of noodles than would seem humanly possible. At Da Emanuel, owner Emanuele Ridi has applied the “more from less” aesthetic rule to nearly everything in sight. The interior design, for one, is indistinguishable from the homely little hostinec down the street. But those voices resonating from the kitchen are speaking Italian, and the pasta, when served, is most certainly al dente. Real al dente. The twice-cooked mounds of noodles served in most other local “Italian” restaurants with similar prices are, comparatively, an embarrassment. 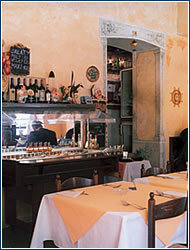 Many years ago there was another trattoria called Da Emanuel, this one on Italy’s Tuscan coast – Isola D’Elba to be exact. 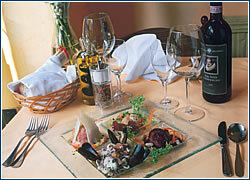 The owner and cook was a local fisherman with a knack for blending the fruit of his daily labors with fresh pasta. It’s interesting to ponder what the fisherman would make of his grandson one day peddling those same dishes in the chilly environs of eastern Europe. But this is exactly what happened: the grandson, Emanuele Ridi, first came to Prague ten years ago to help his father run a new clothing outlet. He met a few other Italian refugees stranded in the land of meat and potatoes, and they began cobbling together their own dishes at home. By 1998, Ridi (together with his Czech girlfriend, now his wife) had decided to take his predilection for seafood and pasta public. Thus the second installment of Da Emanuel was born, a long way from home. Ridi labored in the kitchen, while his girlfriend waited tables. Due to a dramatic pick-up in business, this “Mom and Pop” set up is no longer feasible. The staff at today’s Da Emanuel speak almost wistfully of those first couple of years, when a mere three to five tables could be expected daily. Somewhere along the way, something happened to prick the attention of the dining public. Something the owner can’t even quite put a finger on. Why is your restaurant so ridiculously popular now, Ridi is asked, to which he can only shrug and posit, “the food.” The food – that’s it. That’s why this unremarkable-looking place gets so much mileage out of intense word-of-mouth. That’s why these tight quarters that might accomodate 30 people are nearly always filled to brimming. And that’s why Ridi, a mere 29 years old, now claims to be considering opening a second Da Emanuel in the city center. But simply saying “the food” is the restaurant’s main draw requires some qualification. There’s a good chance that if you stray too far from pasta, Da Emanuel’s subtleties will be lost on you, and you may end up asking yourself what makes food here worth twice what it costs down the street. To truly enjoy Da Emanuel’s good gifts, it’s best to try one of the daily specialties, not least the delectable spaghetti cartoccio, a dazzling combination of seafood and noodles cooked and then baked to perfection. Aside from pastas, the regular menu is dotted with an array of filets, risottos, and seafood including swordfish, shrimp, monkfish, and sea bass. There are also fresh lobsters on offer every Thursday. The wine list is small but satisfying, ranging from a good Bardolino at CZK 300 per bottle to a Tuscan Guado al Taso for CZK 2,950. “You go to Tuscany, they’ll have the same kitchen I have here now,” says Ridi. “Same products, pasta al dente and wines.” You may be inclined to agree – but before you can see for yourself, you’ll most certainly have to reserve a table in advance. One of the most popular restaurants in the quiet spa town of Poděbrady in eastern Bohemia takes advantage of its romantic location right under the castle. 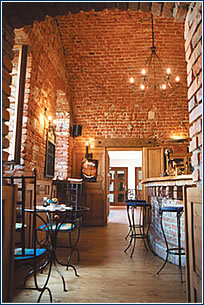 The atmosphere is carried further in the interior – brick walls, antique furniture, and pleasant music. 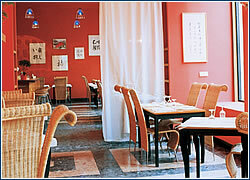 It’s an ideal place either for a romantic dinner, for business lunch or for all sorts of private parties. 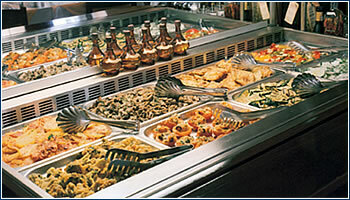 The menu is international, with meet dishes prevailing. The most popular are steaks and game dishes, such as boar medallions. Kovárna is especially sought-after during summer, because of the barbecue that takes place in the garden. The only thing that could be criticized is the service. The servers could be a bit nicer and smile more – at least enough so that they do not diminish the otherwise excellent impression the venue makes. SUSHI LOVERS throughout the city will rejoice at the unveiling of the latest raw-fish emporium.But you’ll find no paper lanterns or tacky red-and-gold screens here – instead a warm and welcoming interior featuring the inimitable accoutrements of famed Czech designer Bořek Šípek. The staff is obliging, and the sushi is certainly some of the most well-prepared in Prague. If you prefer your meals cooked, the menu can accommodate you with tempura, teriyaki and various noodle dishes. There’s also a dessert of fruit sushi with white chocolate sauce, for those who appreciate the unusual counterpoint of flavors.